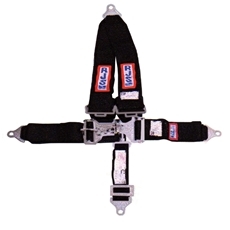 The v-mount seat belts are available in three different mounting options, bolt-in, wrap-around and snap-in. Mounts directly to cross bar behind seat. They include a 2" wide crotch strap. Pull down adjusters. 16.1 SFI certified. NOTE: Due to this product being SFI certified and dated they are shipped directly from the manufacturer. Seat Belt, 5 Point, Universal, "ELITE"